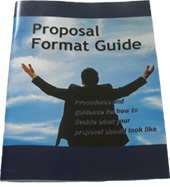 The most frequent question we get asked is "what should my proposal look like?" This is closely followed by "can I see a sample of a proposal?" Even though we tell people that winning proposals are built from the ground up to meet the concerns of specific customers and not by following samples, people still crave them. Unlock our premium content, including the recipes, forms, checklists, etc. that make it easy to turn our recommendations into winning proposals. Carl is an expert at winning in writing. The materials he has published have helped millions of people develop business and write better proposals. Carl is also a prolific author, frequent speaker, trainer, and consultant and can be reached at carl.dickson@captureplanning.com. To find out more about him, you can also connect with Carl on LinkedIn. Click here to learn how to engage Carl as a consultant. In addition to PropLIBRARY's online resources, we also provide full-service consulting for when you're ready to engage one of our experts. It all starts with a conversation. You can contact us by clicking the button to send us a message, or by calling 1-800-848-1563.